I was surprised but not surprised when I noticed that it has been exactly a month since I posted an update. 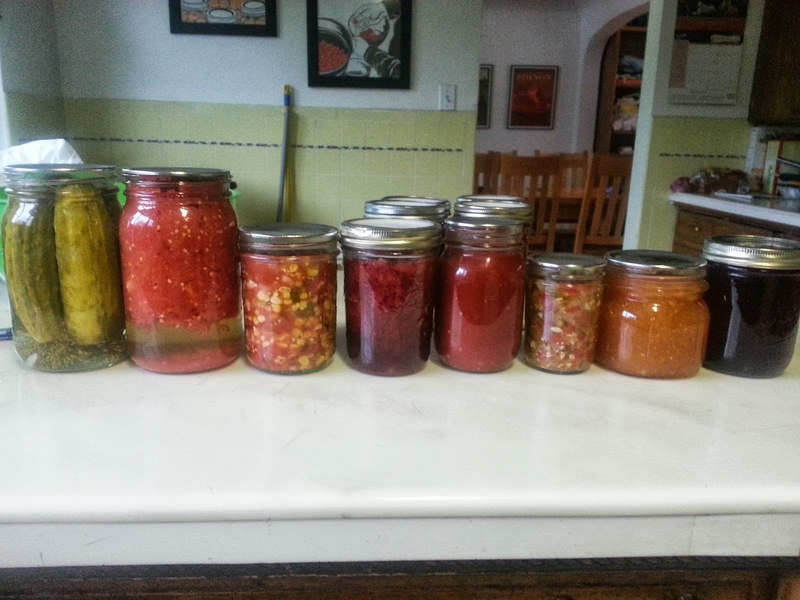 It has been that frenetic end of summer harvesting/preserving chaos. Even out of our relatively modest garden, we have gotten an amazing amount of bounty this year. Our tomato plants (7 Roma and 2 cherry) have produced well over 100lbs. by my best reckoning. The pepper plants (5 green bell, 1 ancho, and 1 jalapeno) were covered. 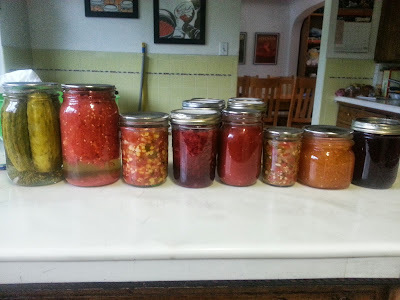 The preserving was made more extensive when a Facebook friend posted this link (Can-o-Rama 2013 from Northwest Edible) to my wall with a note about "don't you wish you had the time to do this". What she doesn't realize is that for people with my disorder (if only it had a name...) just make up the time and this post ended up having three dangerous links. One, I ended up using her "almost free tomato sauce idea" to make food out of the tomato skins that I've always wasted when I can diced tomatoes every year. Two, she linked to a dill pickle relish recipe only a day after I'd been wishing I knew of a reliable one. Three, and most deadly, she introduced me to a book - Food in Jars by Marisa McClellan. 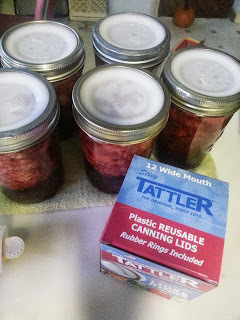 I went out and bought the book and immediately discovered it has 15 canning recipes that are on my must try list. This is not practical but again, my disorder compelled me, although physical amounts of time have somewhat tempered the damage. I went totally crazy, including a day of cleaning frozen berries and fruit out of the freezer to make things I wanted to try. So far cantaloupe vanilla jam (surprisingly delicious), strawberry vanilla jam, cranberry syrup, rhubarb syrup, ketchup, and roasted corn salsa have been attempted. They are all really really good. Everybody, please go out and get this book then make your own ketchup. Seriously, I don't think we can go back to store bought now. This book, and the blog it is a companion to, are truly delightful. Unpreserved, there are/were 6 pumpkins, 7 individual cantaloupe, 4 watermelon, 2 eggplants, and about 2lbs. of carrots. 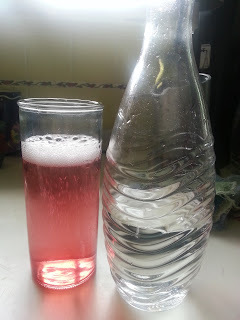 Frozen, there are two gallon bags of diced beets, one gallon of broccoli, one gallon of edamame beans, 24 oz. of tomato sauce, and marinara sauce (15 pints and 7 "pizza portions"). Quentin bought me these. I tried them on the strawberry vanilla jam and only had 2 of 5 seal. I'm going to have to do some reading up on tricks people have for being successful. Cranberry syrup is yummy in sparkling water and in vodka drinks. I wish it was a little tarter though. Less sugar next time. There was a bag of frozen bananas that had been there long enough that they had to be used. The day before my freezer clean out, I had dead bananas on the counter, found a muffin recipe, made it, loved it, then realized that I hadn't really followed it. I'd forgotten the egg, replaced the butter with applesauce, decreased the sugar, added more banana and decreased the flour. Heehee. 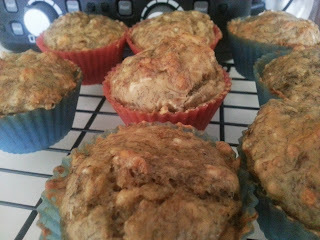 I wrote down "my" recipe and made three dozen muffins with the freezer bananas, froze 2 dozen and we ate 1 dozen fresh. "My" recipe, which yields about 18 muffins, is below, bake at 350 for 18-22ish minutes. 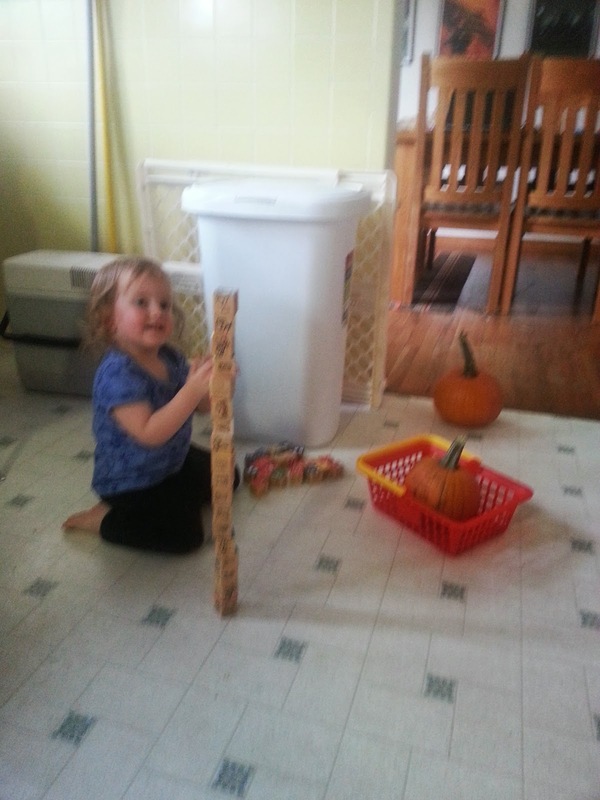 Willow helped all day one day, building long trains and tall towers of blocks and rearranging pumpkins. For some reason she believed that a pumpkin needed to sit squarely in the middle of each doorway. Wish I knew what goes through her head. I looked into the reusable tops. I don't have them, but after reading through many comments I would say that the trick is in the amount of head-space. The plastic is thicker than the metal tops so they need at least one full inch of head-space to have enough vacuum pressure to seal. Lastly, take a look at the soft rubber mats meant for a workshop floor. They come in 3'x6' lengths and are about 1/2" thick. They just might be the thing you need.